The next time you are Key West Florida fishing, be on the lookout for the Thunnus Atlanticus or Blackfin Tuna. This fish is black and oval shaped with a light coloring of yellow along the side of its body. 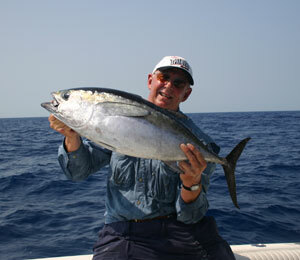 It is one of the smallest of all the Tuna with a maximum weight of around 46 pounds and a maximum length of 39 inches. This should not dissuade the avid fisherman because the Blackfin Tuna travels in large numbers, allowing for a bountiful catch when a school is found. A favorite meal for the Blue Marlin, the Blackfin Tuna, like other Tuna, is fleshy and has a high quality flavor. Unlike some of the other types of Tuna, the Blackfin is not listed on the World Conservation Union Redlist (it is not endangered and is not considered to be in immediate threat) and there is no size or bag limits for fisherman. The Blackfin Tuna calls the western Atlantic Ocean its home but it is most prevalent along the Florida coast from autumn to spring; it moves to cooler waters during the hot summer days. In these waters, it will hunt for small fish, shrimp, squid, and small crustaceans like the crab. 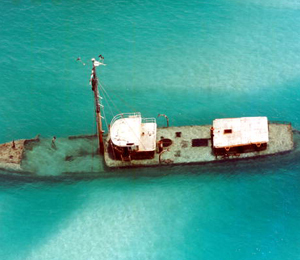 Its primary hunting grounds are over reefs and in deeper, offshore waters. Although it does hunt in deeper waters, it often feeds near the surface of the water. It hunts by straining or by chasing down and engulfing prey with its speed. 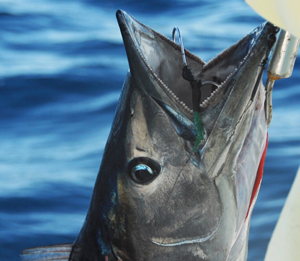 There are a few things to keep in mind when fishing for Blackfin Tuna. First, the Blackfin Tuna, often referred to as the "twilight tuna", is light sensitive. It likes to stay in deeper waters and come up to hunt when it sees a reflection of light shine off of baitfish that are near the surface. Accordingly, it is best to fish for Blackfin Tuna in early morning and in the evening. Because of its excellent vision and sensitivity to light, using a fluorocarbon leader can prove helpful. This is especially true since the ideal time for Blackfin Tuna fishing is at sunrise and at sunset and the ideal place is in clear waters. Second, although live bait fishing and kite fishing are both acceptable methods of catching Blackfin Tuna, trolling is the most common method of choice. This allows one to cover large areas of water, which is helpful with this fast, migratory fish. When trolling, ballyhoo, bonito strips, and artificial trolling lures are all good choices for bait. Effective live bait choices include live pilchard, live herring, and live shrimp. The pilchard can also be used for chumming, which is another effective method for catching Blackfin Tuna. Third, the equipment choice when fishing Blackfin Tuna is often a matter of preference. When trolling, though, deep sea fishing rods and reels with a fishing line of 50 to 60 pounds is the most common. 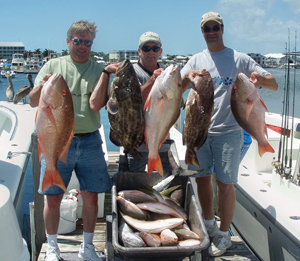 When live bait fishing, lighter tackle, spinning rods or spinning reels are acceptable. Whatever you use, remember that the Blackfin, like other Tuna, will put up a good fight so be prepared. These great fighters make Blackfin Tuna a good sporting fish. Although the Blackfin Tuna can range from Cape Cod down to Brazil, the Florida coastline, and Key West in particular, is a great area to find this fish. Other than the dead heat of the summer, this fish can be found, in great abundance, almost all year round in the waters around the Florida Keys. Its small size makes it accessible to anglers of any age and any fishing experience level and its reputation for being a fighter makes it a sporting catch for even the most experienced fishermen.